THE sixteenth annual production sale of the Whiteley Hey flock was held on behalf of Paul Slater, Cheshire, at J36, Crooklands. The top priced ram goes through the ring at J36. 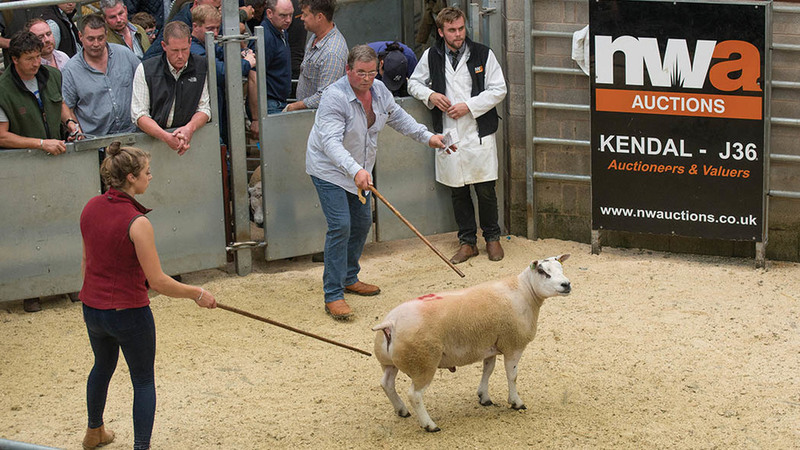 Leading lot of the day at 2,000gns was a Culsh-sired Beltex cross Texel ram which sold to repeat buyers W.H. Brass, Penrith. Close behind was a Texel ram at 1,900gns. By a Scrogtonhead-bred ram, it sold to A.N. and A. Jelly, Chorley. Charollais cross Beltex rams peaked at 900gns, paid by R.E. and J. Roberts, Anglesey, for the section topper. Female trade hit £620/head for a pair of three-quarter Beltex cross shearlings which are by the 10,000gns Ardstewart Swagger Jagger. They sold to C.R. and F.L. Swinnerton, Market Drayton. A pair of pure-bred Texel two-shear ewes headed the older section at £420/head. Top priced ewe lambs were a pair of Beltex cross Texels which were by the 2014 premier breed sale champion Artnagullion Tinky Winky. The buyer was M. Bindloss and Son, Penrith. A run of black ewes and rams peaked at 600gns for a ram which sold to Messrs Parkin, Maryport. 150 rams, £774.20; two- and three-shear ewes, £273.81; shearling gimmers, £281.05; ewe lambs, £158.02. Auctioneers: North West Auctions with Mitchells.